In the times we live in, trolling is almost a way of life. With the weapon of social media at our fingertips, having the restraint to allow another individual to voice their opinion is now perhaps a superpower. Most of us aren't born with it, and Delhi Chief Minister and Aam Admi Party supremo Arvind Kejriwal and his trusted aide, Manish Sisodia are no different. One of the few people on Twitter to back Suresh Prabhu's latest surge charge policy for premier trains, Rahul Kanwal, the Managing Editor of India Today, found himself engaged in a Twitter war with the two politicians. 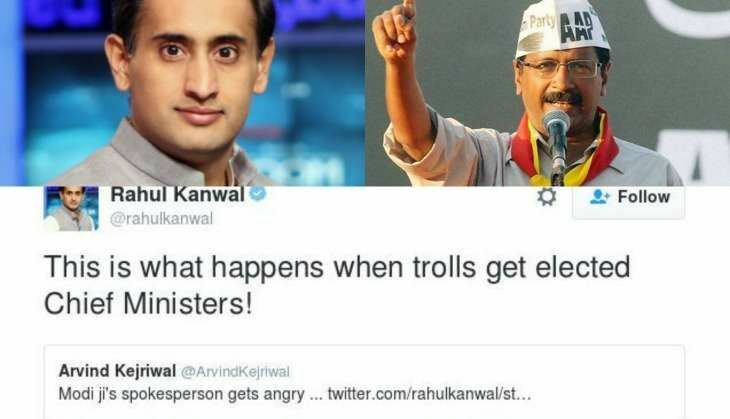 It began as an exchange between Kanwal and Sisodia, before Kejriwal jumped in. Mudslinging followed. Criticism of rail price hike political opportunism. How is @sureshpprabhu supposed to generate revenues if relatively well off don't pay. People expect railway facilities to be at par with bullet trains but don't want to pay for the service. This attitude needs to change. @msisodia No good service comes for free. If passengers want railway services to improve, they must be willing to pay for it. @msisodia and did you see what honourable CM said? To have an argument like you are having is one thing, to cast aspersions quite another! @msisodia so you accept that @ArvindKejriwal is a troll? Glad that the realisation has finally dawned on you too. @msisodia no one said anything about you being a troll. Why are you adding yourself to this category? @msisodia @ArvindKejriwal chief I'm dealing with trolls in the only way one can. If you ignore the troll he thinks he won the argument. @ArvindKejriwal real pity that a radical political idea born with such high hopes is frittered away with such high levels of immaturity. After about seven tweets, Kanwal calmed down enough to stop explaining the concept of free speech. He also tired of explaining the difference between appreciating a move made by a politician and endorsement of a party. Strange how expressing an opinion can get lost in the crossfire between party politics. Strange how journalists can no longer opine without being questioned about their affiliations. Strange how every new policy is met with derision without question, without fail. Strange how it is this very TRP-shooting bickering that we all thriving on.